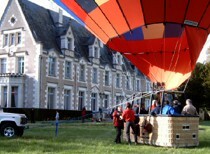 combining a balloon flight and an hotel. The flight can be rescheduled. A stay in the fresh air ! In case of bad weather, the hotel can't be cancelled or rescheduled.